Few breeds are as universally recognized and appreciated as the Tennessee Walking Horse. Three things set the modern Tennessee Walking Horse apart from all others - the gliding, natural running walk gait, the distinctive Walking Horse look, and a heart bigger than any mortal body can account for. The running walk is characterized by its smoothness to the rider and relative ease on the horse. It is much faster than an ordinary walk, averaging speeds of 8-10 miles per hour, with some horses maintaining the gait at 12 miles per hour. (Higher speeds usually mean that the horse has broken gait and may be performing a rack or stepped pace, either of which can pick up considerable speed.) There is an even 1-2-3-4 beat, with a rhythm and footfall pattern identical to a regular walk or flat walk. The flat walk graduates to the running walk as the horse picks up speed and takes a running step as he switches from one front foot to the other. Meanwhile, the hind legs reach far forward, landing well past the track left by the front foot on the same side. The hind legs drive from behind in long strides and the horse may bob his head, flop his ears and even clack his teeth in time to the rhythm. While the breed also performs a slower flat walk, and other gaits, it was this powerstroke, drive-from-behind, running walk gait that put the Walking Horse - and its namesake state - on the map. Before the Tennessee Walking Horse became known, the patron saint of the south had been The bond between a Tennessee Walking Horse and his owner shows as this young horse turns to his owner for reassurance. Seven-year-old Mariah Caballero hits a good lick. ©Darlene Wohlart ©Bill Erickson the American Saddle Horse (later renamed the American Saddlebred). It took a blend of elegant Saddlebred (with its under-pinning of Thoroughbred [Denmark] blood), tough, elastic Morgan, fast and powerful Standardbred, and now extinct Canadian Pacer and Rhode Island Narragansettto set the cornerstone of early Walking Horse – or Plantation Horse breeding. When the Tennessee Walking Horse Association of America (later changed to the Tennessee Walking Horse Breeders’ and Exhibitors’ Association [TWHBEA]) sat down in 1935 to bestow the honor of foundation sire (F-1), several good horses were under consideration, including TOM HAL, HARRISON CHIEF, COPPERBOTTOM AND MCMEENS TRAVELER. 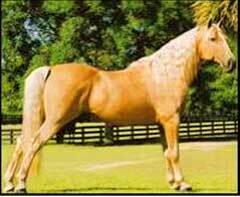 But the horse chosen as the foundation stallion of the Tennessee Walking Horse breed was ALLAN. Foaled in 1866, his sire was ALLENDORF, of elite Standardbred breeding, and his dam was MAGGIE MARSHALL, a documented seven-gaited, great-great granddaughter of FIGURE, the original Morgan horse. An additional 114 horses were recognized as foundation stock, including ROAN ALLEN, another famed seven-gaited show horse. Many horses in the early years contributed gait through undocumented dams. “Plantation bred” or “Colonial Saddle stock” might be the only indication of a long line of distinguished southern breeding on the bottom of many a good horse’s pedigree. The origins of these “local mares” are disputed by some and proudly acclaimed by others as having been rooted firmly in the hills of the Appalachians or Ozarks, from lines dating back to the early 1800s. elongated head (though many lines have crossed away from the familiar “walking horse head”), long graceful neck, sloping shoulder, medium-to-short back, and in good lines, incredible substance and “bone”. Horses still average 15-16 hands and weigh in from 900 to 1100 pounds. Walking Ponies (horses smaller than 14.2 hands) and larger strains (16 hands plus) are being bred to meet the growing and variable demands of the market for naturally smooth gaited, reliable, attractive horses. All colors are allowed and white is not penalized. The sabino gene, mistaken for roan early on, throws some interesting and splashy coat patterns. To many who fall in love with this breed, the willing and forgiving attitude is the strongest allure it has to offer. With a long history of service to families and farmers, as well as providing entertainment in popular Saturday night horse shows of the 19th and 20th century, their innate sweetness endured them to all. Sadly though, their good nature has not always worked in their favor. Ironically, a lively disposition was often disdained because such horses would not tolerate the spurge of the Walking Horse showring soring. Concocted to get an edge on the competition, soring is the application of chemical irritants, or other means of causing pain to the horse’s front feet or forelegs in order to alter the horse’s gait. Pain causes the horse to pick up his forefeet quickly, while straining to drive his hind legs as far underneath his belly as his muscles, tendons and ligaments will reach, in order to minimize the weight his front feet must bear. Today’s Walking Horse has allies his long-suffering ancestors did not. By 1970, the blatant cruelty of soring became too much for the American public to ignore and the Horse Protection Act was passed making the practice illegal. Subsequent years have seen the Act whittled and fine-tuned as the Walking Horse show industry struggles to comply. Over 30 years after the passage of Federal Law, the Sound Horse movement, composed of organizations dedicated to the enjoyment and exhibition of naturally gaited, sound (unsored) horses, is gaining momentum. Some have tried to fight the abuse from within the Tennessee Walking Horse show industry itself, others have branched out and offered new shows in which the law against soring is stringently enforced. FOSH is a leading organization in fostering sound horse shows, and others, such as the National Walking Horse Association, Sound Horse Organization (which benefits other anti-horse abuse causes as well) and American Horse Protection Commission have followed suit. With the TWHBEA reporting more than 430,000 horses registered through it, the Tennessee Walking Horse is second only to the American Quarter Horse in the United States. His popularity abroad extends as near as Canada and as far away as Germany and Belgium. Because of the backlash against soring, today there are several associations and registries in addition to TWHBEA. The Canadian Walking Horse Association, Tennessee Walking Horse Heritage Society, National Walking Horse Association, International Pleasure Walking Horse Registry and the Part Walking Horse Registry all seek to maintain the natural gait and soundness of this uniquely American treasure. As in the old days, today’s Tennessee Walking Horse fills many roles. As the times have changed, the Walking Horse’s versatility has only grown to meet and exceed the challenges. There are Walking Horses excelling in endurance riding, ranch work, dressage, jumping and, of course, the show ring, pleasure and trail riding. Long-time sound horse exhibitor Morgan Rhoades adds, “I think the flat-shod, pleasure owners and riders are becoming more knowledgeable in a lot of areas, including breeding. Ivory Pal, Tennessee Walking Horse stallion owned by Rafael Valle of Ivory Knoll Ranch shows the elegance and form of today's walking horse. He was 2004 FOSH Horse of the Year and Southeastern U.S. Grand Champion.